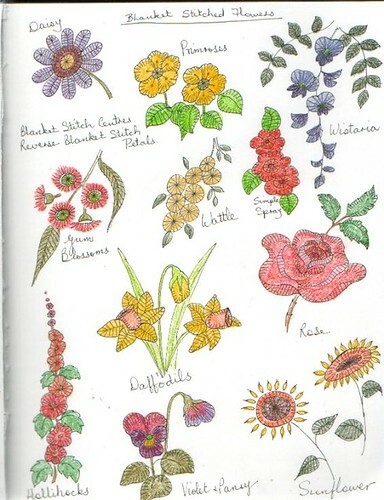 This is another page from my Visual Journal where I have drawn different flowers all using Blanket or Buttonhole stitch. I've taken care to draw the direction of the stitches so that they best represent each flower or leaf. These drawings are to remind me of simple, quick and easy, floral designs to include on crazy quilt blocks, especially when they are part of a Doing Your Own Block swap. I love using simple Blanket Stitches close together to form a solid mass or else separated by tiny spaces to give a more representational view of a petal or leaf. This form of stitchery was very popular in the early 1900s even if sometimes the colours were a bit bright and off-putting. There is no need to strictly adhere to the colours of nature with crazy quilting so it's a great way to be really creative. Hi Isabelle, thanks for your comments. My head is full of ideas which tend to go away if I don't put them on paper. Keep watching because I'll be putting more drawings on as I do them. Glad they are of use to you. Hi Vivienne, I have just discovered your blog via somebody else's blog (they go on ad infinitum - is that the phrase?). Anyway, I am new to blogging, but have started my own, simply to enable me to comment on other blogs! My friend Sharlee introduced me to it, and said how many fascinating things she had found, and now I have found them too. If you have a minute to check my blog, you will see that I collect antique linen, and also do some embroidery. I just love the old doilies and cloths where button hole stitch has been used to create flowers, so your sketches greatly appealed to me. I have many UFOs that didn't come with instructions when I found them, so I tend to stumble through my own interpretation of stitches and colours, and sometimes it just does not look right. But as Isabelle is doing, I am going to try to save your sketches for future reference.